Engineers from Iowa State University have developed a new flexible, stretchable and tunable “meta-skin” that brings us one step closer to real invisibility cloaks. 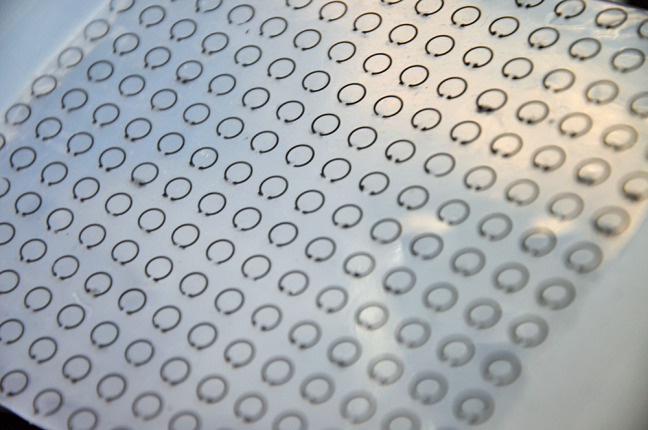 The flexible skin uses rows of small, liquid-metal devices to cloak objects from radar. The meta-skin is based on the properties of metamaterials, composites not found in nature and that can manipulate electromagnetic waves. Stretching and flexing the polymer meta-skin reduces the reflection of a wide range of radar frequencies. The team was formed in hopes of proving that electromagnetic waves, with even shorter wavelengths of visible light, can be suppressed with flexible, tunable liquid-metal technologies. The team devised rows of split ring resonators, only a half a millimeter thick, embedded inside layers of silicone sheets. The electric resonators are filled with galinstan, a metal alloy that’s liquid at room temperature and less toxic than other liquid metals such as mercury. The rings acted as electric inductors and the gaps created electric capacitors, which together were able to create a resonator capable of trapping and suppressing radar waves at a certain frequency. When the meta-skin is stretch, the size of the liquid metal rings changes, as well as the frequency the device suppresses. In testing, the radar suppression was about 75% in the frequency range of 8 to 10 gigahertz. If an object is wrapped in the meta-skin, the radar waves get suppressed in all incident directions and observation angles. Jiming Song, a professor from Iowa State’s department of computer and electrical engineering, even alluded to the idea that the metal skin could one day coat the surface of the next generation of stealth aircraft. “The long-term goal is to shrink the size of these devices,” said Liang Dong, associate professor, also from the department of computer and electrical engineering, who worked on the paper . “Then hopefully we can do this with higher-frequency electromagnetic waves such as visible or infrared light. While that would require advanced nanomanufacturing technologies and appropriate structural modifications, we think this study proves the concept of frequency tuning and broadening, and multidirectional wave suppression with skin-type metamaterials.